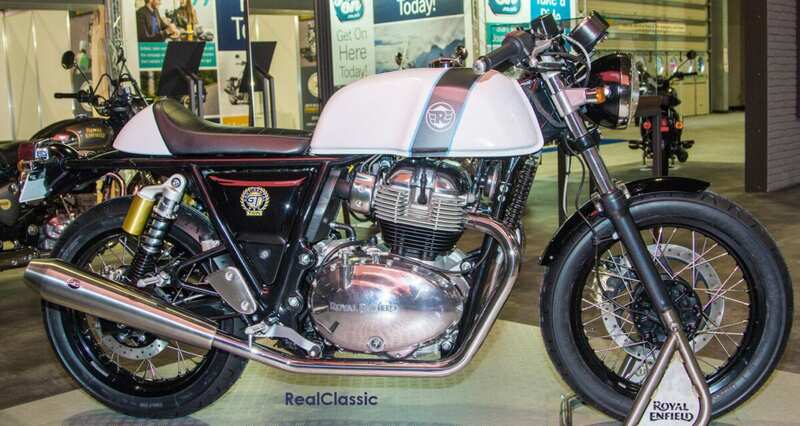 Several manufacturers showcased models at this winter’s Motorcycle Live exhibition which seek to recreate the classic bikes from their marque’s glory days of yesteryear. Richard Jones inspects several of them on our behalf – along with some other retro offerings – and gets the ball rolling with the long-awaited big twin from India…. 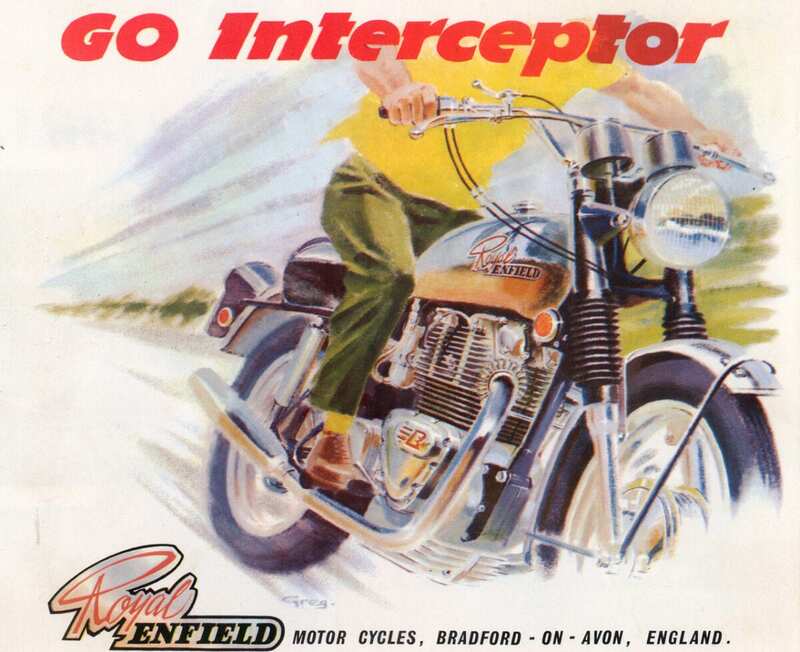 In mid-1970 the last Series II Interceptor rolled out from Royal Enfield’s factory in Bradford on Avon, the iconic Redditch factory having closed in 1966. 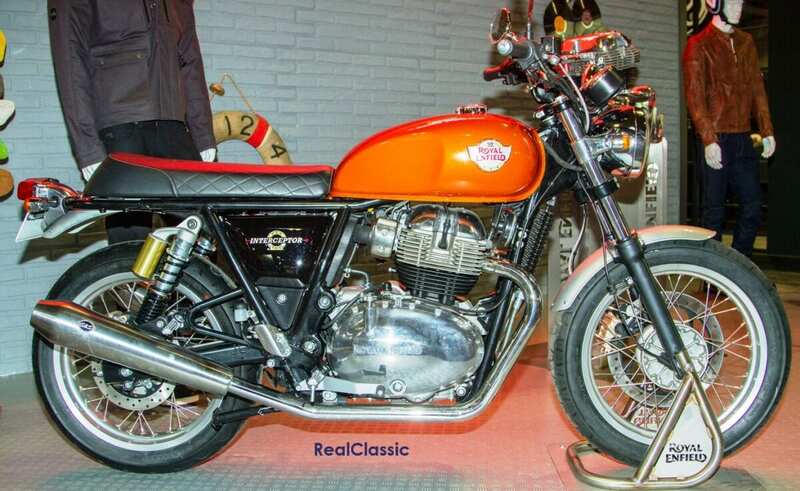 The model had first appeared in 1962, becoming the Series II in 1968 which saw the 736cc twin ohv engine provided with wet sump lubrication, fuelling from twin Concentric carburettors and the old frame featuring Norton gaitered forks and an 8” sls drum brake. The Albion four-speed gear box remained the same, with the trademark neutral finder, as did the rear hub, brake, cush hub and QD facility. Output was said to be 52.5bhp at 6500rpm and a top speed was apparently well in excess of the magic ton. Vibration? 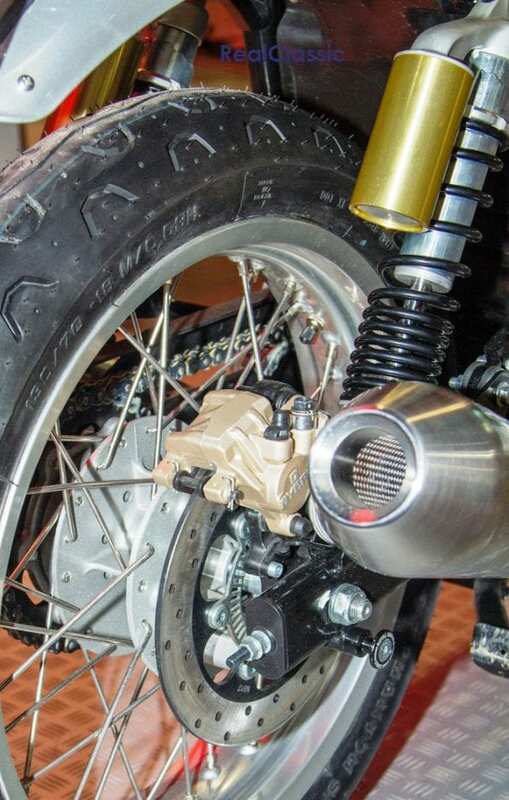 The factory claimed not, thanks to a dynamically balanced and weighty crankshaft. 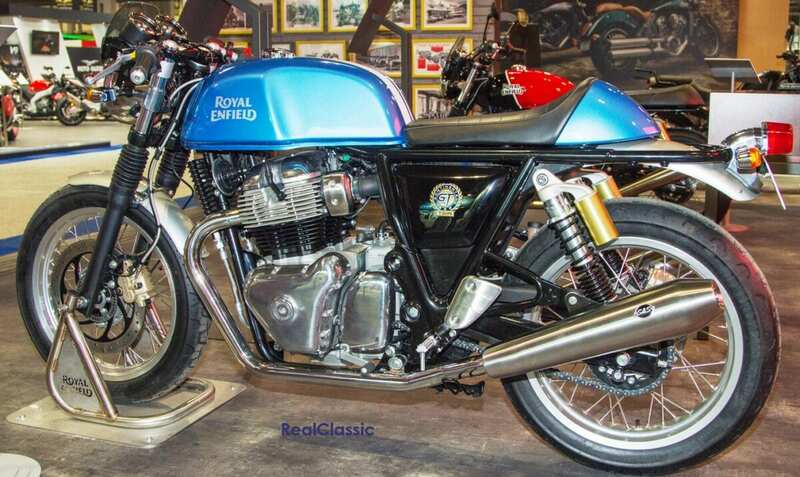 So good were the engines that the Rickman brothers acquired a number after the Wiltshire factory closed, housing them in their frames to produce a run of about 130 Rickman Enfield Interceptors, still much sought after. 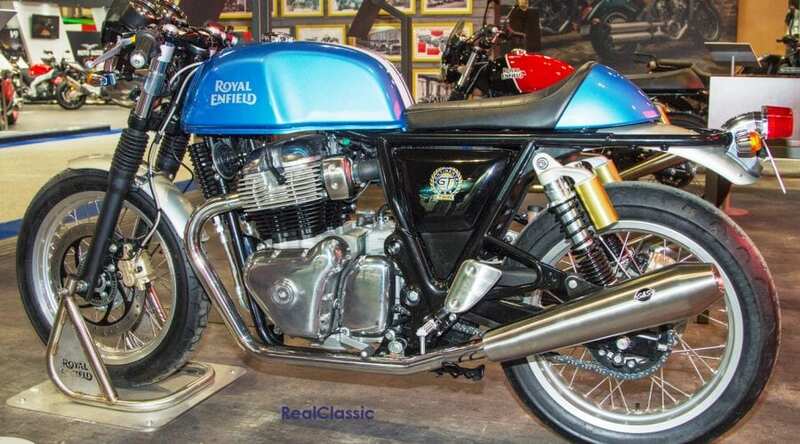 Now, a mere 47 years after Bradford on Avon closed, a new Royal Enfield Interceptor has been revealed, this time from Chennai, India, where it is being manufactured by Eicher Motors. 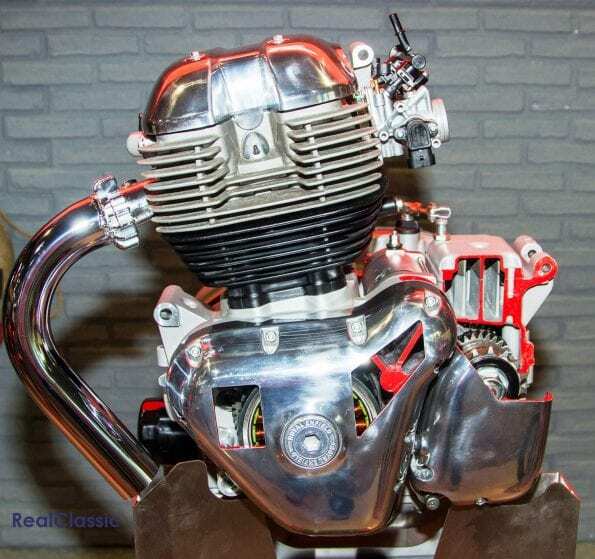 But hold on – the new 646cc oil/air cooled sohc parallel twin was largely developed at Royal Enfield’s technology centre in Leicestershire so it still boasts a strong connection with the UK. This is also perhaps why, to some of us of a certain age, the engine looks as we expect with cooling fins and solid, well-rounded engine covers. The rest of the cycle also harks back to the halcyon days of the 1960s with spoked wheels, a tubular double cradle frame, kick as well as electric start and twin upswept silencers. That’s not to say the new Interceptor is technically challenged – far from it. Euro 4 compliance is essential so we have Bosch fuel injection, digital electronic ignition, six-speed gearbox with a slip-assist clutch, single discs front and rear with ABS and the sort of suspension one expects these days. Power is given as 47bhp at 7100rpm. Want something a bit more sporty? Well look no further as Royal Enfield are also introducing the Continental GT. 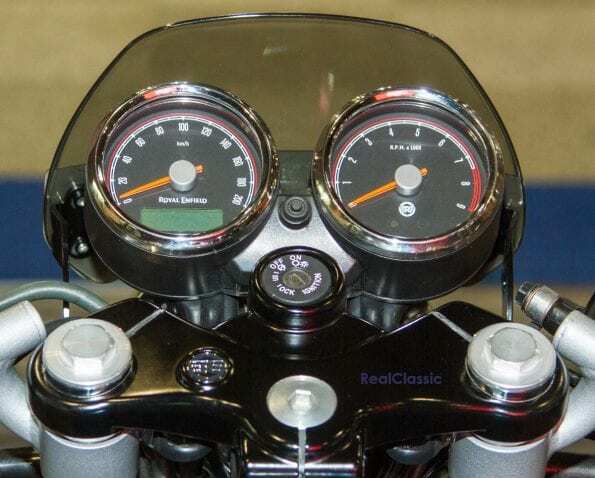 It’s substantially the same motorcycle although the café racer version weighs in at 4kg less than the Interceptor, with 1.2 litres less fuel capacity and lower seat height – 790mm for the single-seat Continental compared with 804mm on the dual-seat Interceptor. Incidentally, that single seat looks the thing, as do those clip-ons and rearsets. The proof of the bike is in the riding and road tests of the new Interceptor will be much anticipated and pored over. Incidentally if any of those nice people at Royal Enfield are reading this my bag is packed and I’m ready to head to Chennai at the drop of a (crash) hat.